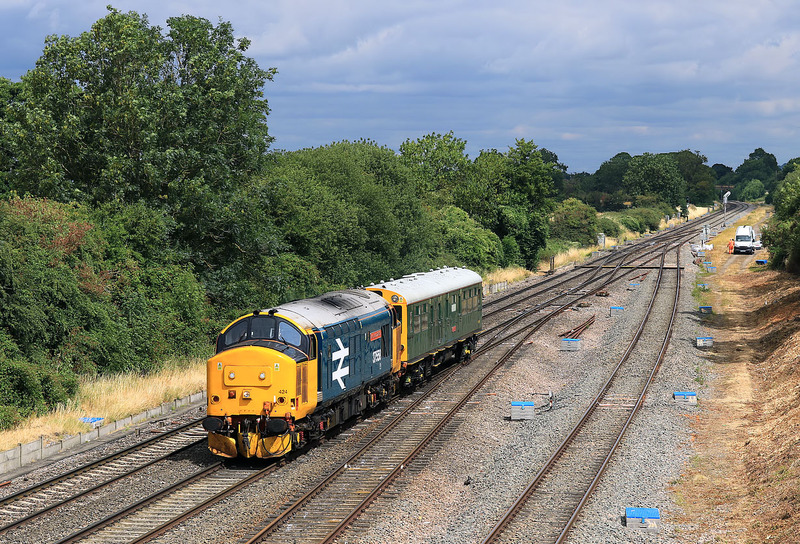 An unbelievably lucky picture at Standish Junction on 24 July 2018. 37424 (37558) Avro Vulcan XH558 and inspection saloon 975025 Caroline catch a very brief patch of sunshine, as they speed southwards, running as the 5Z02 08:00 Crewe Gresty Bridge to Exeter St. Davids. Although naturally it was much sunnier when I was back home in the afternoon, while I was on the bridge at Standish around midday it was largely cloudy, and about this time the cloud cover was almost total. Amazingly, just as the loco came into view under the bridge in the background, the sun found a small hole in the cloud, and stayed out just long enough for the train to pass!